GOV.UK has done some significant things to improve the content that government publishes. The style guide has helped people in government and beyond to open up their content by writing in plain English. And we’ve trained over 1,000 writers how to create content that meets user needs. But now that over 300 government organisations are publishing content on GOV.UK, there’s a unique opportunity to join up and simplify government services and information. So we got together a small group of content professionals from around government to help us work out how to do that. We need to go from fixing content problems to fixing the causes of content problems. And because over 1,500 people are publishing on GOV.UK, we need to find a way of doing it at scale. In other words, we need a content strategy. The group reviewed some draft content strategy principles, and we talked about 2 areas in particular. We should only publish content that meets a user need, unless it’s something we have to publish for legal or transparency reasons. Content designers are not editors. Their job is to develop a deep understanding of user needs, and to design content to meet those needs. Subject matter experts and legal advisers are an essential part of the publishing process: they check content for factual accuracy and make sure the legal position is clear. But to do their job properly, a content designer needs the authority to make publishing decisions. That’s why centralised, specialist publishing teams do better at meeting user needs. GOV.UK is not just a website: it’s a publishing service for government. 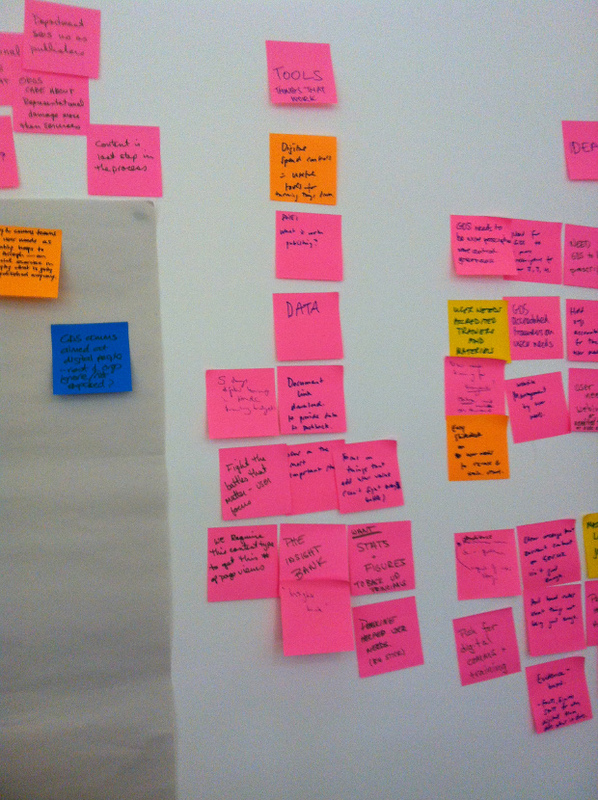 So we think it makes sense to build on what’s been learned from designing and running other government services. If you’re involved in designing a government digital service like register to vote or find an apprenticeship, you’re encouraged to experiment with different approaches and share what you learn (eg through the design patterns hackpad). Once there’s a consensus on what works, it becomes ‘official’ guidance in the Government Service Design Manual. The Digital by Default Service Standard sets out the standards required, and it’s backed up by rigorous service assessments. We’ll update our guidance to publishers and content designers to reflect the most successful approaches and practices - and do more to make sure these practices spread around government. We want to hear what you think of this approach. what sort of additional publishing guidance would be useful to you? what have you found is the most effective way of identifying content that doesn’t meet user needs? Or if you’re working in government policy or communications - what’s your experience of working with publishing teams to create GOV.UK content that meets user needs? What are the challenges, and what’s the best way to overcome them?